2018 was a fantastic and successful year for dot-art and dot-art Schools. 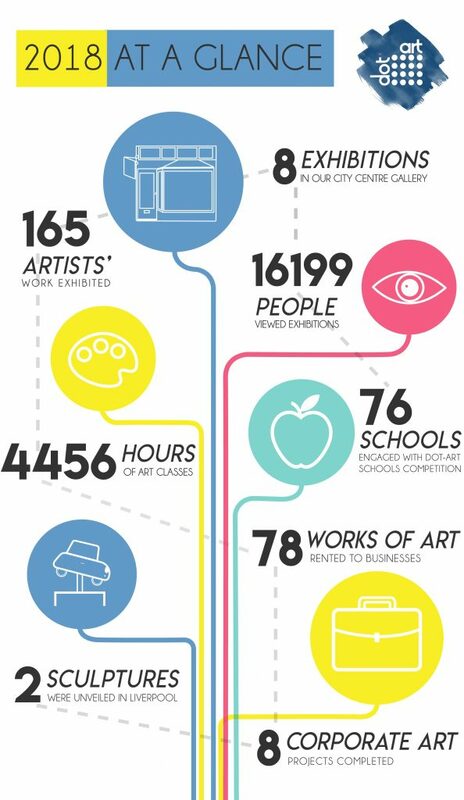 We’re already getting stuck-in to the new year and planning some very exciting projects for the year ahead and so we’d like to take a quick glance back over the past year and share our growing achievements which couldn’t have happened without our talented artist members, school, partners, venues and clients. The year began with the end of our third annual Christmas exhibition The Liverpool Collection which featured 20 artists’ work, each showcasing our vibrant city and its unique culture. dot-art gallery continued to show 8 exhibitions throughout the year, exhibiting the work of over 165 artists.  16199 visitors viewed, interacted with, and purchased art from local artists at both dot-art Gallery and the annual Liverpool Art Fair on Liverpool’s iconic waterfront. In May we had our most successful solo show to date ‘Metamorphosis: John Petch x OMD’ which celebrated a collection of striking, geometric art by John Petch including the original album artwork for the electronic band OMD. 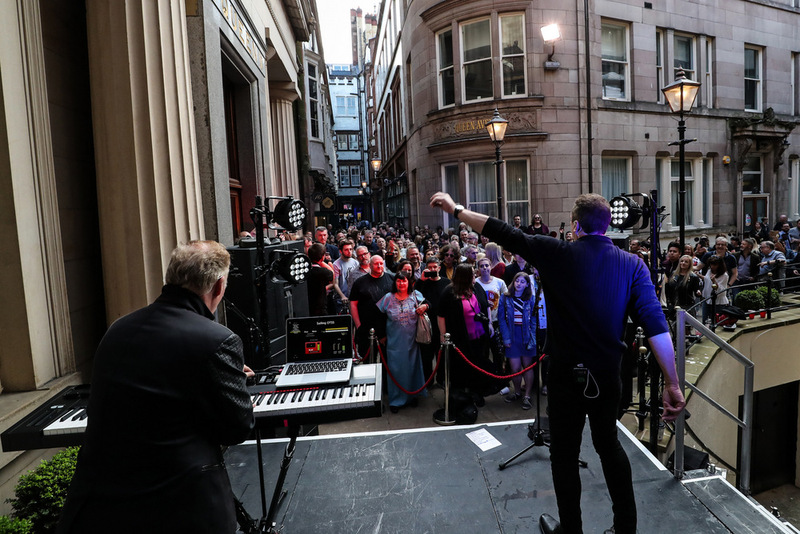 The exhibition formed part of Liverpool’s cultural highlight LightNight; and served to compliment the theme of Transformation, including a not-so-secret gig from the band OMD themselves in our historic Queen Avenue. Our artist members taught over 4456 hours of art classes across five inspiring city centre venues in Liverpool such as the Bluecoat and Williamson Tunnels. 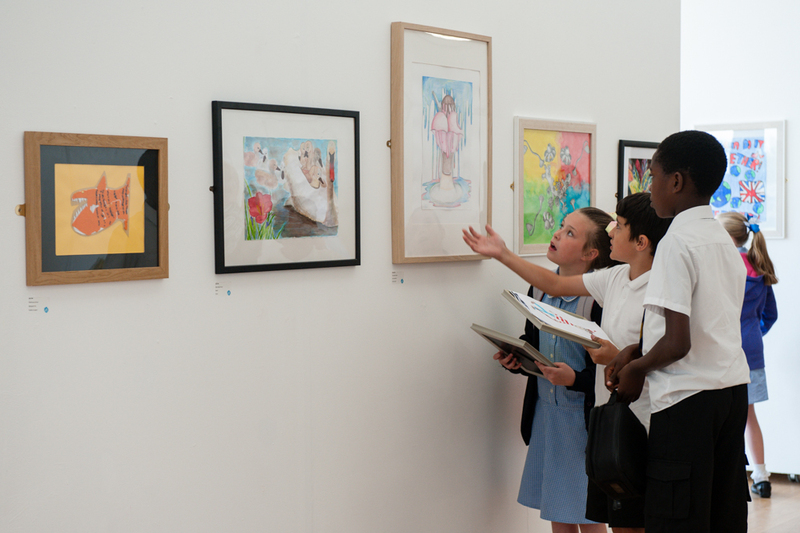 dot-art Schools engaged with 76 schools for the annual inter-schools art competition in both the Liverpool city region and Cheshire, with the competitions culminating in public exhibitions and prize-giving events at LJMU Art and Design School and Chester’s Storyhouse. dot-art were thrilled to be part of the unveiling of 2 sculptures created for two projects, The Liverpool Plinth Competition and the MV Derbyshire Memorial. On Saturday 15th September, at Liverpool Parish Church, over 450 people attended a ceremony to mark the unveiling of a memorial garden and sculpture, to commemorate the 44 people lost when the MV Derbyshire sank in 1980. dot-art was honoured to be involved in the creation of this new, permanent piece of public art. Artist and dot-art Member Tony Evans was selected and produced a design which was to be produced in bronze and form a fitting and lasting tribute to those lost. 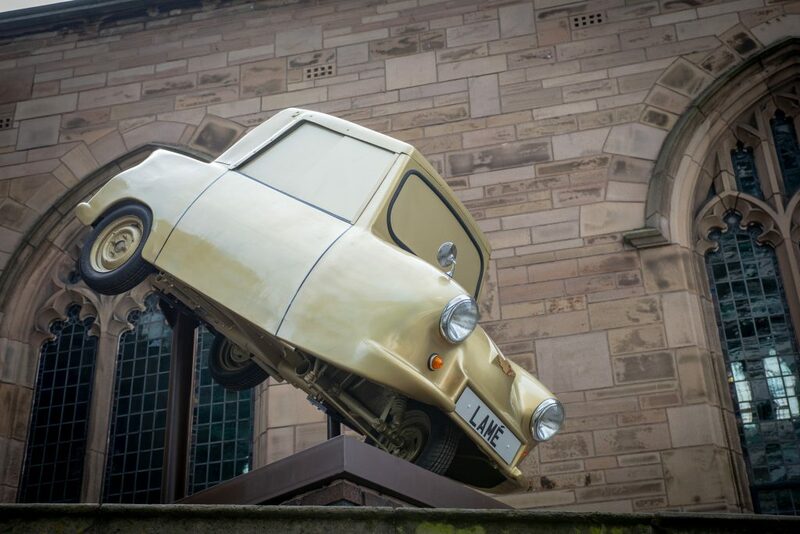 For the inaugural year of The Liverpool Plinth competition, dot-art partnered with Liverpool BID and Liverpool Parish Church to bring a new and exciting sculpture each year to a plinth which had stood empty for several years at St Nick’s Church. A panel of industry experts selected Tony Heaton’s Gold Lamé as the winning artwork which has served as a striking and progressive public art piece for the past year and has set the bar high for the second year of the competition which is once again open for submissions. Not only have we hosted exhibitions and been involved in public art projects, this year we have put 78 large scale artworks into business spaces across the north-west region and have completed 8 corporate art projects! We hope the year to come is our most successful yet with resolutions to work with more artists, put more artwork in the public realm, work with more fantastic businesses and get more students interacting with art!